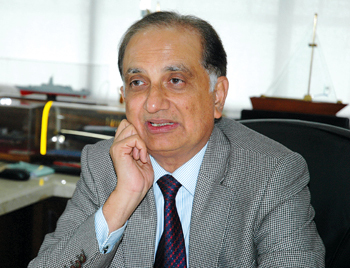 Rear Admiral (Retd) R.K. Shrawat is the Chairman and Managing Director (CMD) of the Mazagon Dock Ltd (MDL). 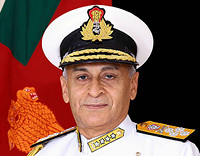 In an interview with SP’s Naval Forces, the CMD of one of the busiest yards in South Asia, gave out details of MDL’s current and future programmes. SP’s Naval Forces (SP’s): Can you elaborate on the evolution of MDL from a small dry dock to our country’s premier warship building yard? CMD, MDL (CMD): MDL has a long and eventful history spanning over two hundred years. We began as a small dry dock way back in 1771 primarily to service ships of the British East India Company. The next two centuries saw the yard progressively developing its ship repair and construction facilities. It passed through various ownerships till 1960 when the Government of India took over the reins and the yard became a public sector undertaking. MDL has the distinction of building a number of frontline warships for the Indian Navy comprising stealth frigates, destroyers, submarines, missile boats and the corvettes. In the civilian field, almost 50 per cent of the offshore well head platforms in Bombay High have been constructed by MDL. A fairly large number of cargo and passenger ships, dredgers, water tankers, fishing trawlers, barges, jack-up rigs, tugs, offshore supply vessels and multi-purpose support vessels have been our contribution to the mercantile marine. Today, the company enjoys the “Mini Ratna” status amongst the public sector undertakings (PSUs) and is a Schedule ‘A’ company under the administrative control of the Ministry of Defence (MoD). In a nutshell, MDL, the premier warship building yard of the country, is proud of having contributed handsomely to the nation’s growing eminence on the geostrategic canvas. SP’s: Having completed more than a year now at the helm of one of the busiest yards in South Asia, what do you reckon as a major challenge for indigenous warship building? CMD: Our main challenge is sourcing of shipbuilding inputs from indigenous sources. For this, the indigenous industry catering to shipbuilding needs to be strengthened and nurtured. MDL’s focus is to remain in the forefront for timely delivery of frontline warships and submarines that add teeth to the blue-water capability of the Indian Navy. Secondly, acquiring skilled manpower and retaining them while ensuring that they are trained to be on par with the best in the industry requires continuous effort. Thirdly, maintaining the levels of technologies available with the advanced countries requires constant audits of key processes and working methodologies for achieving better productivity and imbibing best practices. SP’s: What are the major projects with MDL now and in the pipeline? How do you evaluate the future scenario? CMD: During the last three years, we have delivered three Shivalik class frigates. Currently, three destroyers of the Kolkata class are in the final fitting out stage, first of which is planned to be delivered by the end of the year. In addition, four ships of the same class are already in the assembly line. Six Scorpene submarines are at various stages of completion. MDL and the Garden Reach Shipbuilders and Engineers Ltd, together are slated for an order of seven frigates which are follow-on of the prestigious Shivalik class stealth frigates. The modernisation project undertaken by MDL has seen the latest technology infrastructure in place and with the adoption of new production methodologies MDL is well poised to take up futuristic complex warship and submarine building projects. SP’s: Being one amongst the elite group of shipyards capable of submarine construction, the latest being the Scorpene, would it be safe to say that MDL is a major contributor towards Navy’s transformation from a ‘buyer’ Navy to a ‘maker’ Navy? CMD: Today, the Indian Navy is already transformed into a maker’s Navy. Yes, MDL along with other defence public sector undertakings (DPSUs) have played a major role in achieving this transformation. To take this process further, the capacities both in terms of quality and quantity of indigenous feeder industry to DPSUs needs to be enhanced. Coming to the Scorpene class submarines, the fabrication of six pressure hulls has been completed nine months ahead of schedule with the ongoing transfer of technology from the French collaborating partner. The learning curve for the personnel has been very encouraging and the standards achieved are comparable to the global norms. While three boats are getting outfitted; two boats are at an advanced stage of construction. The first boat will be commissioned into the Indian Navy by September 2016. SP’s: It is reported that MDL is leveraging private sector participation for current and future warship and submarine construction programmes. Can you elaborate the plans? CMD: We have the demonstrated capability and expertise to build frontline warships customised to the Navy’s requirement. Along with modernisation of the yard infrastructure, expansion of our subcontracting vendor base and recruitment of requisite skilled manpower, our joint venture experiment with private players in the industry is an initiative to garner their capabilities. Considering all aspects, we are moving cautiously in this direction. SP’s: MDL has embarked on a modernisation programme that can give a fillip to the company’s core activities. Can you please elaborate on the key ingredients of the programme? CMD: The modernisation programme was conceived as an enhancement in process engineering and infrastructure upgrade to enable implementation of the “integrated construction” methodology in shipbuilding practised by the advanced nations. Besides enabling assembling and handling grand blocks, the modernisation will facilitate substantive amount of pre-outfitting which translates into a considerable reduction in build time periods. A 300T Goliath crane that straddles across the slipways; a modular workshop where grand blocks could be assembled and lifted; an impounded wet basin that can hold two destroyer class warships and two submarines simultaneously; a cradle assembly shop for assembling the sections of the conventional submarines and electronics stores, are the major components of the modernisation programme. SP’s: What are the areas you would focus during your tenure? CMD: Human resources with the requisite complex skill sets are our main assets. Nurturing human resource in a conducive environment in order to enhance productivity levels is the key and is my first priority. Secondly, the yard has already initiated a system of benchmarking our key processes with international shipyards. This would enable us to adapt international best practices in the yard, both for ongoing as well as future projects. Also, with our modernised infrastructure, we are now capable of implementing “integrated construction” methodology that is on par with global standards. To complement this upgradation, we intend to collaborate with international shipyards of repute for imparting the requisite soft skills and re-engineering of processes. With this, we expect an upgradation of technology levels and also enhancement of capabilities. In a nutshell, while I would like to see MDL grow as a modern and dynamic shipyard competing with the best in the world, my emphasis would remain on timely delivery of ships and submarines to the Indian Navy. SP’s: What are the key initiatives that have been implemented or are on the anvil to improve the work environment and productivity? CMD: MDL’s mission statement “Build Quality Ships on Time” reflects our aspiration as a shipyard for continual holistic improvement in all spheres of the company’s activities. E-tendering has already been adopted ensuring a fair and transparent procurement process. Enterprise resource planning has been implemented across the board, wherein all data are system generated and captured for usage. MDL is engaged in a number of corporate social responsibility (CSR) initiatives to demonstrate our obligation to the society at large. Personnel and material safety is another aspect. I am quite passionate about it and believe that no job or task is more important than health and safety of our personnel. Therefore, provision of an absolutely safe environment in our work places through provision of state-of-the-art equipment and imbibing safety oriented standard operating procedures are a few of my prime objectives. SP’s: What is your vision for MDL as a DPSU in the emerging scenario of private sector players also vying for a sizeable piece of the defence production pie? CMD: The private and public sectors in defence need not work at loggerheads. There is enough space for all considering the force level requirements and long-term aspirations as enshrined in the maritime strategy of the Indian Navy. The public sector has niche domain expertise and capabilities acquired through rich legacies from the past. The private sector has large spare capacities that could be leveraged for defence production. Synergising partnerships where capabilities and capacities are married will result in winning scenarios for all the stakeholders. 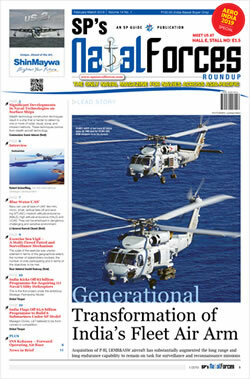 SP’s: As a DPSU, do you have any plans for diversification into other business areas in the future, considering that nominations for naval projects may not come through in the future? CMD: We are open to diversification. Historically, we have also made an impact in a non-defence sector like oil and gas, triggered by the oil crisis of the 1970s, by building offshore platforms for the Oil and Natural Gas Corporation Limited (ONGC). Besides warships and conventional submarines, we also have expertise in building merchant ships. Two state-of-the-art multi-purpose support vessels were built recently. One has been delivered to a foreign client while the next is awaiting delivery. We have some land across the creek in the Nhava area where the requisite infrastructure can be developed for diverse needs. We are exploring various options in this regard.